bluBuzz, LLC lol i think Mrs Blubaugh's Forth grade class might be getting a crap load of traffic to www.Blubuzz.com next week. Also some curious misfit names in there but also some great apps - any thoughts? Also check out http://www.networkworld.com/podcasts/demo/2009/022609democast.html for some behind the scenes info. Now if only they could break the Telstra monopoly of last mile and implement competitive FTC I'd move home. And it got me thinking, what web applications am I ready to pay for that i would shell out $20 a year for? Would I pay for Blogger? possibly but i'm thinking about moving it to Wordpress to be hosted on my own server for better url support anyway. Would I pay $20 a year for Skype? Probably but would the 50 or so contacts I have also pay $20, probably not all, and therefor would it retain the same value if they weren't there? Would I pay $20 for Digg? a site I visit daily and love, nope, but only because it replicates content i would consume from elsewhere. Would I pay $20 for Facebook - No, i find it's value falling and wonder about all the people who paid for and built facebook apps last year, did they see a return? Would I pay $20 for http://my.live.com/ (my rss reader) - probably but I would also expect them to make a better product and ensure that they brought out a mobile version (which they've been promising forever...but never delivered) . It's interesting that my view is changing because I'm 2 months away from launching my own web application that I look at advertising in a different light - is $5cpm sustainable (nope, i dont think it should really be any more than about $1-$2 for most sites) -can or even should most website apps be advertising supported? (btw we will be launching advertising / freemium model that has upgraded features for paying customers). So I put the question to you - what apps are you prepared to pay $20 a year for? Reading articles like this http://www.businessinsider.com/cable-companies-ganging-up-on-hulu-2009-2 and comments from Comcast http://www.forbes.com/2009/02/19/cable-internet-video-bandwidth-business-media_cable.html?feed=rss_business where on one hand they 'crow' about their new 60Mbs service they also state that no one will be able to download more than 250gb per month. Well my fellow New Yorker friends…..I hate to say this but I think it’s time for me to move to the West Coast. I just found out Paxio is offering residential internet at 1GB/s upstream and downstream for only $245 per month. Yes that is 1,000Mbps both upstream and downstream with no usage limits unlike the crap that TimeWarner and Comcast are proposing with us locally. If you think you would like to sign up for a service like that here in Manhattan then can I suggest you send the email I pasted below showing them your support. Lets break the New York cable company monopoly and get on with using the internet the way it was meant to be used. Can you please tell me when you are coming to New York as I would love to sign up for this service and finally be done with my cable company. I was at Mobile Barcamp for Social Change today. ……But seriously techie barcamps are organized way better – At BarcampNYC people who want to talk about similar topics merge into shared groups in 5 mins or less. Some times I was looking at the board with despair when 3 or 4 of the topics in the time slot were pretty much the same concept. Having said that I did get to learn at least 5 really interesting points and met at least that many interesting people to keep in touch with after the event so was worth the effort. Basically his entire application couldn’t be built for or even run on the iPhone and that’s even assuming that Apple would actually approve and pass his application. I think the winds of change are coming, it might take a while because of distributed application stores and multiple handset manufacturers but all the really cool apps you are going to see will be built on the Android platform and the uncool kids will be left using iPhones. Is it just me or does there seem to be a lot more BS marketing in the last few months? I dont know if i'm just noticing it more and i cant really recall any specifics but i was reading newsweek.com today when i saw this advertisement come up. I mean whoever photoshopped this should be taken out the back of the office and shot. 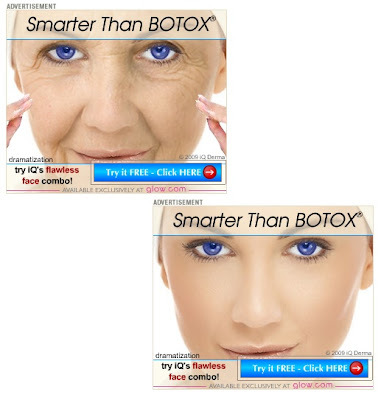 We all know that there is no truth in advertising but this is just ridiculous, 'class action' legal case anyone? 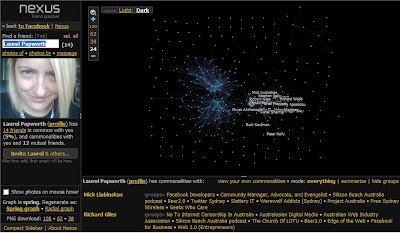 Neat social networking application - shows you links between all of your Facebook contacts and their sublinks. It's not perfect but still pretty cool. You can get more information by viewing the actual application on this link here. There is something just so freaking clever with Kenneth Cole. 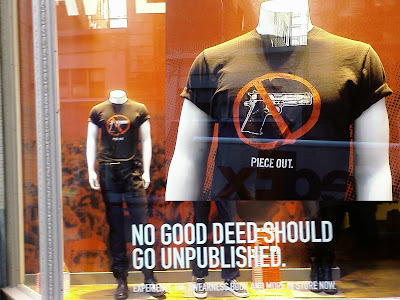 Doesn't matter how many times i walk past their window they always have the wittiest most though provoking statements I've ever seen in a retail window. Or how many coders have quit their day jobs only to go back to work after 3 months because their bills aren't being paid. On a more serious note i noticed that Google Android 'paid for' store launched this week. Anyone reading this tried porting their Apple applications over to Android? how much effort is involved? what are the issues? Is there money to be made by building an application that automatically ports all iPhone apps over to Android? My thoughts are it’s actually not a bad idea. No perfect for every employee (eg parents with school age kids) but think about it, if you are open to a new experience what harm could come from going to live in Vietnam or Czech Republic for a couple of years. Your cost of living would go way down, you get to experience a new culture. Living in Malaysia I found that you can get used to having staff cook, clean, take care of your house etc and it costs much less so you can actually end up saving money even though you might be being paid less therefore enabling IBM to reduce their overheads. I’ve often said there is no real need for me to live in Manhattan for my work, may as well be in Colorado or Antigua for all it really matters. Extremely worthwhile film, not overtly political but says a lot about the state of the nation. Wow no wonder Warren Buffet is rich. Tell me where can I get 12% return, plus the upside of his convertible bonds actually making him a profit on his stock holding. At the moment with Swiss Re trading at 26 francs (and his convertible price of 25 francs) he has made a 4% return on his potential conversion + the interest. Easy to make money when people are throwing money at you on terms like that. This new DTV transistion delay to June is a huge waste of tax payers money. Will make sure those procrastinators get their act together. So what did you think? who won the Superbowl commercial competition? For me the Avon commercial definitely had the strongest call to action. The line in the commercial "I can never be laid off or fired" was speaking directly to an amazing cross section of the "community" who i'm sure tomorrow are responding.